Animals in the Goldilocks zone—neither too big, nor too small, but just the right size—face a lower risk of extinction than do those on both ends of the scale, according to an extensive global analysis. 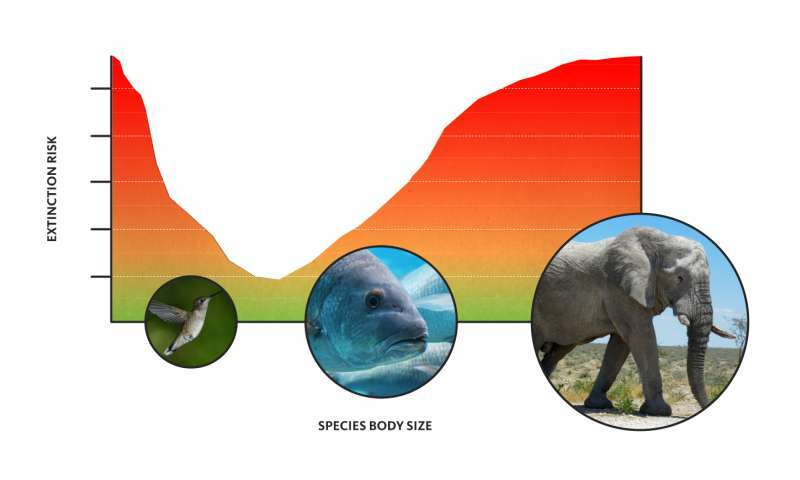 Reporting today in the Proceedings of the National Academy of Sciences, researchers who determined body masses for thousands of vertebrate animal species showed that the largest and smallest species face a greater risk of extinction than do mid-sized animals. Disproportionate losses at the large and small ends of the scale raise the likelihood of significant changes to the way natural ecosystems function in forests, grasslands, oceans and even rivers and streams—"the living architecture of the planet," the researchers wrote. "Knowing how animal body size correlates with the likelihood of a species being threatened provides us with a tool to assess extinction risk for the many species we know very little about," said William Ripple, a distinguished professor of ecology at Oregon State University and lead author of the study. Ripple and colleagues from the United States, Australia and Switzerland looked at the more than 27,000 vertebrate animal species assessed by the International Union for the Conservation of Nature in the so-called Red List. About 4,400 are threatened with extinction. Among the groups of animals evaluated were birds, reptiles, amphibians, bony fishes, cartilaginous fishes (mostly sharks and rays) and mammals. The largest animals are threatened principally with harvesting by humans. "Many of the larger species are being killed and consumed by humans, and about 90 percent of all threatened species larger than 2.2 pounds (1 kilogram) in size are being threatened by harvesting," said Ripple. "Harvesting of these larger animals takes a variety of forms including regulated and unregulated fishing, hunting and trapping for meat consumption, the use of body parts as medicine and killing due to unintentional bycatch," the authors wrote. Meanwhile, threats to the smallest animals may be grossly underestimated. The smallest species with high extinction risk consist of tiny vertebrate animals generally less than about 3 ounces (77 grams) in body weight. These diminutive species are mostly threatened by loss or modification of habitat. Examples include the Clarke's banana frog, sapphire-bellied hummingbird, gray gecko, hog-nosed bat and the waterfall climbing cave fish. Small species that require freshwater habitats are especially imperiled. Different conservation strategies will be needed to address threats to the largest and smallest animals, the scientists said. Well known mammals at the large end of the scale—whales, elephants, rhinos, lions—have been the target of protection programs, but conservation attention is also needed for large-bodied species that are not mammals. They include large fish, birds, amphibians and reptiles such as the whale shark, Atlantic sturgeon, Somali ostrich, Chinese giant salamander and the Komodo dragon. Human activity seems poised to chop off both the head and tail of the size distribution of life, the authors added, which will fundamentally restructure many ecological communities.